Sam Figgis is a 5th generation farmer in Hernhill. He is pursuing his childhood dream of rearing livestock. It all started with 4 pigs and a few turkeys at the bottom of the garden. 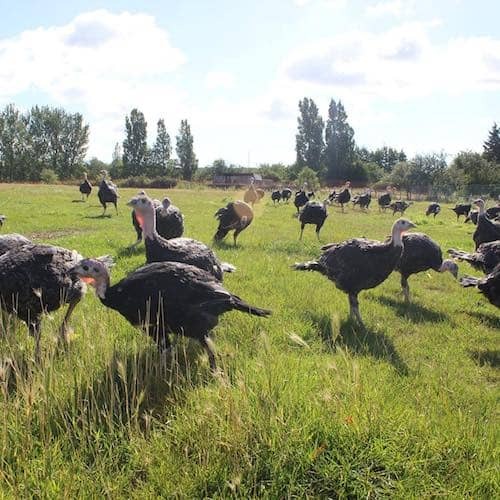 The birds are raised on Wey Street Farm is situated between Faversham and whitstable. The Figgis family have been family in the village of Hernhill for over 100 years. The farm produces – apart from their fantastic turkeys- Apples, strawberries and plums. At Sam’s Turkeys all of our turkeys are reared to the highest welfare standards. They are free to range the meadow and grassland which makes up nearly 4 acres of land on our farm. Traditionally grown over a longer period of time than your standard supermarket turkey. This allows the tenderness and flavour to develop, making this bird turkey the centrepiece of your table. To find out more about Sam's Turkeys complete the form below.